Join us on "The Hunt for Something Higher" all weekend at 45th Telluride Bluegrass Festival!! WIN tickets to our Secret Living Room Set on Sunday, a pair of Meier Skis, a Winterstick Snowboard, an Osprey Pack, and more from our Something Higher Merch Line! We're playing a secret Living Room set on Sunday of Bluegrass weekend, and this is the only way to get tickets!! 1) SCAVENGER HUNT: Follow us on Instagram @leftoversalmonmusic to play! This Thursday, Friday, and Saturday at noon we'll post photos of merch items to find in Town Park. There will be 5 chances to win each day. Find them first, post a photo of yourself with them in hand and the hashtag #thehuntforsomethinghigher, then head over to the Meier Skis vendor booth to pick up your tickets. 2) TELLURIDE TOWN CRAWL (21+ ONLY): Visit the Meier Skis vendor booth in Town Park to get your punch card and start your crawl to Something Higher! 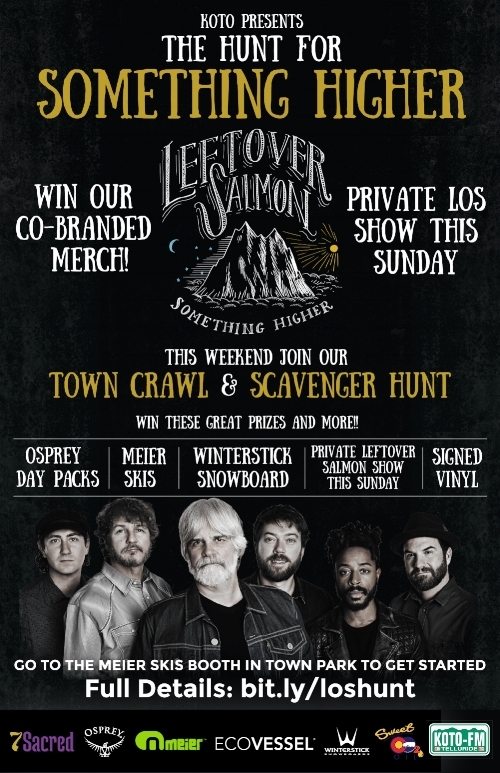 A Leftover Salmon Rep will be at the vending booth to help you get started and give you your first clue. Figure out where to go next, get your card punched and keep on crawling! Many chances to win along the way! Get your card completely punched and we'll have a raffle box waiting for you at the last stop. From here, we'll draw 20 winners for a pair of tickets each to Sunday's show, and a winner for each of our Something Higher Line products: Winterstick Snowboards, Meier Skis, EcoVessel bottles, Osprey Packs, Signed Something Higher Vinyl, and more! Stay tuned to this event and our Instagram account all weekend for updates and more!